Additional information can be found by visiting the Products Page and clicking on the specific model you are interested in. Building requirements, technical specifications and brochures are available for each chamber model. How does HBOT enhance wound healing? What is the protocol for hyperbaric treatment? What are the clinically accepted indications For HBOT? Is there research being done on other conditions being treated with HBOT? What does a patient experience during treatment? What is the recommended service for our chamber? What are acceptable cleaning and disinfecting agents for the Acrylic Tube? Is my room large enough? What is the recommended flooring for the Treatment Room? What are the pressure and flow requirements for the Perry Air-Break-Mask assembly? Can the air-break supply be from portable bottles? What are the recommended cleaning procedures for the air-break mask demand-valve assembly? Does Perry Baromedical provide finished EKG or ECK monitoring cables for use with the Perry chamber? What is the standard electrical penetrator “thru-hull” port size? There is a slight odor inside of the chamber, is this normal? What are the room size, piping, and electrical requirements for chamber installation? What is the maximum weight of a patient to be treated? What type of linens & gowns are allowed in the chamber? Can chambers be positioned in direct sunlight? How should the chamber be stored overnight? Will the acrylic tube be harmed by direct sunlight? How do I launder the hyperbaric chamber acrylic cover? Q. How does HBOT enhance wound healing? Q. What is the protocol for hyperbaric treatment? Q. What are the clinically accepted indications For HBOT? A. In the United States, almost all health care plans/third party payors reimburse for HBOT treatments listed below. There are numerous conditions reimbursed by commercial payors and workman’s compensation. 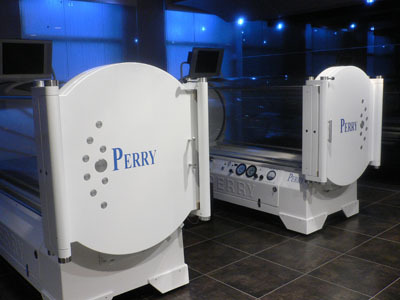 In addition, other areas in the world are using HBOT for numerous other conditions. Q. Is there research being done on other conditions being treated with HBOT? Q. How often is HBO administered? Q. What does a patient experience during treatment? Q. What is the recommended service for our chamber? A. Please refer to the chambers Operation and Maintenance manual for recommended daily, weekly, monthly, semiannual and annual servicing requirements. Annual preventative maintenance is the most effective way to guarantee the proper function of your chamber and reduce the possibility of non-scheduled maintenance and down time later on. Perry Baromedical Corporation strongly recommends that all chambers be serviced annually by an approved Perry technician. Q. What are acceptable cleaning and disinfecting agents for the Acrylic Tube? Detergent in a solution of warm water (not exceeding 120 degree F.). The acrylic cylinder should be washed with a clean, soft, lint-free cloth that has been moistened in a solution of water and mild soap, Joy (or) Ivory dish detergent (1:100 water solution).Rinse with a soft, lint-free cloth moistened with clean water. Do not allow water or disinfectant liquid to accumulate inside the chamber. Never use a dry cloth or abrasive cleaning agents on the acrylic window. Q. Is my room large enough? A. Use the Hyperbaric Facility Design Guidelines, Version 1.0, July 2004, compiled by the UHMS Associates Facility Design Committee as a guide. It can be found by clicking here. Q. What is the recommended flooring for the Treatment Room? A. Flooring in the chamber area should be tile. Conductive tile is preferred, but not mandated. Carpet is not to be used. Q. What are the pressure and flow requirements for the Perry Air-Break-Mask assembly? A. Air pressure must be set at a minimum of 70 PSIG with a flow of 160 LPM. Q. Can the air-break be supplied from portable bottles? Q.What are the recommended cleaning procedures for the air-break mask demand-valve assembly? A. Per the manufacturer’s instructions, “cold disinfecting” may be performed on the disassembled outlet adapter and exhalation valve assembly by immersing in a CIDEX solution for a minimum of 10 minutes. Alternately, gas sterilization may be used (e.g. ethylene oxide) provided the temperature of the sterilizer does not exceed 71°C (160°F) and, aeration is performed adequate to remove all traces of the sterilizing agent. Q. Does Perry Baromedical provide finished EKG or ECK monitoring cables for use with the Perry chamber? A. Yes, Perry can provide finished EKG cable sets depending on your particular monitor requirements. In addition, we can supply cable ends, pins, and termination sets if the facility biomedical staff desires to splice their own connections. Please contact Perry Baromedical for a specific equipment and cable set quotation. Q. What is the standard electrical penetrator “thru-hull” port size? A. The standard 19-pin and TCOM penetrators are designed to fit thru a 1-9/32 diameter hole in the rear of the chamber. Q. There is a slight odor inside of the chamber, is this normal? A. There have been very few reports of any residual odor present in the chamber, and in all reported cases, testing has shown that the chamber atmosphere to be within specification. Q. What are the room size, piping, and electrical requirements for chamber installation? A. Please refer to the chamber technical / building services requirements document provided by your salesperson. This information can also be found by going to the Products Page and clicking on the chamber model in question. Q. What is the maximum weight of a patient to be treated? A. The SIGMA 36 and 40 chambers have a weight capacity of 700 lbs., the SIGMA 34 is limited to 500 lbs. Q. What type of linens & gowns are allowed in the chamber? A. All fabrics and other materials should be 100% cotton or approved anti-static material as per NFPA-99 recommendations. Never permit, silk, wool, or synthetic textile materials (except those specifically approved for hyperbaric oxygen use) inside the chamber as they are capable of creating static electricity. Q. What is not allowed in the chamber? A. Electrical appliances, Jewelry, Cosmetics, any alcohol or petroleum based products, pacemaker, implanted pumps, and earplugs should not be used in the chamber. In addition, exclude combustible materials such as paper, magazines, and excess bedding. Q. Can chambers be moved for cleaning of the room and area? A. Yes, please follow the instructions in the Perry Operations Manual. Q. Can chambers be positioned in direct sunlight? A. No. It will damage the acrylic. Q. How should the chamber be stored overnight? A. The chamber needs to be covered with a Perry chamber cover or blanket. Q. Will the acrylic tube be harmed by direct sunlight? A. The cylinder should not be located in direct sunlight or close to a heat source. Indirect lighting of the chamber room is recommended, and , lamps or any other direct light sources should not be placed near the chamber. The acrylic cylinder will be damaged by exposure to UV radiation. Q. How do I launder the hyperbaric chamber acrylic cover? Pre-treat any stains with detergent and cold water. Place the detergent on the stains. After soaking the fabric for 15-30 minutes, gently rub the stains. Use a non-perfumed detergent. For appropriate results, machine wash in hot water, on a normal wash cycle, with a non-perfumed detergent. Rinse twice on a cool cycle. Shake the acrylic cover after removal from the machine to minimize wrinkles. Tumble dry immediately upon completion of rinsing to prevent wrinkles, on low setting. Do not use any dryer sheets. Steam press or iron upon completion of drying to prevent excessive wrinkling.